Guyana has quality athletes who have what it takes to bring home Olympic medals. In fact, being able to produce the next Usain Bolt is not unfounded for Guyana. At least this is the conviction of Minister of Social Cohesion with responsibility for Youth Sports and Culture, Dr. George Norton. “I know we have so many Usain Bolts here in Guyana but we can only unearth them if we provide the necessary facility in the different areas in Guyana so that we can find those athletes,” said Minister Norton. 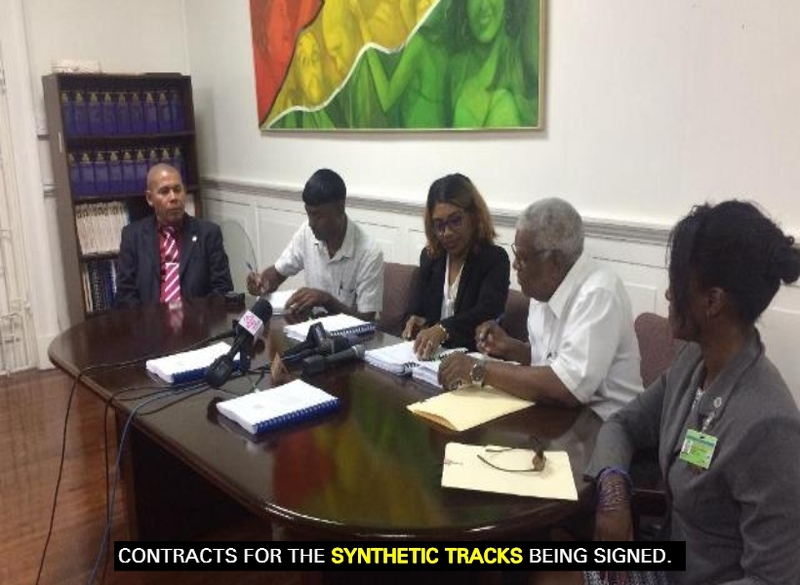 His remarks were forthcoming on Friday even as $320 in contracts were signed for phase three of a project which will cater to the provision of synthetic tracks in Region Six, East Berbice, Corentyne and Region 10, Upper Demerara, Berbice. The contracts were signed by Permanent Secretary to the Department of Social Cohesion, Ms. Melissa Tucker, and representatives of contracting firms B.K. International and Builders Hardware and Supplies for ground preparations. In addition to Minister Norton, the signing of the contracts was witnessed by Assistant Director of Sports, Ms. Melissa Dow-Richardson. Phases one and two of the synthetic track project consisted of preliminary works, surveys and the tendering process. B.K International was awarded $141Million for works at the New Amsterdam, Burnham Park in Region Six while $179Million was awarded to Builders Hardware and Supplies for similar works at the Bayroc Community Centre Ground, Wismar, Linden in Region Ten. Works are scheduled to commence one week from the date of signing and should take three to six months to be completed. Minister Norton said that while he is pleased that the work on the two tracks is heading in the right direction, the signing of contracts is long overdue. It is the view of the Minister that once the tracks are completed, Guyana will be well on its way to showcasing extraordinary athletic talent. Currently the only synthetic track in Guyana is located in Region Three at Leonora, West Coast Demerara.